Boys Gymnastics Team- Two former Hocking Valley Gymnasts are Finalists for the Nissen-Emery Award, the highest award given in Men’s Collegiate Gymnastics. They are Miguel Pineda, Penn State and Ty Echard, Ohio State (Ty started his gymnastics career here @ HVGC and left when he was 12). A total of 7 Athletes were nominated this year for this prestigious award. Girls Gymnastics Team- The Level 4, 5, and 6 Teams competed at Girl Power Invitation in Hamilton Ohio earlier this month where the Level 4 Team Placed 1st!! Level 4 and 5 competed at Fliptastic Follow Your Dreams Meet with Level 4 team placing 2nd and many of the girls placing 1st on events and in the All Around. Most of the girls had top 5 finishes. 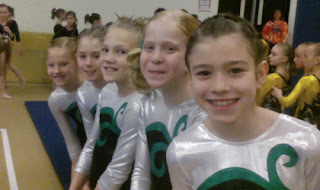 Level 4 Girls Team waiting for March-in @ Girl Power!